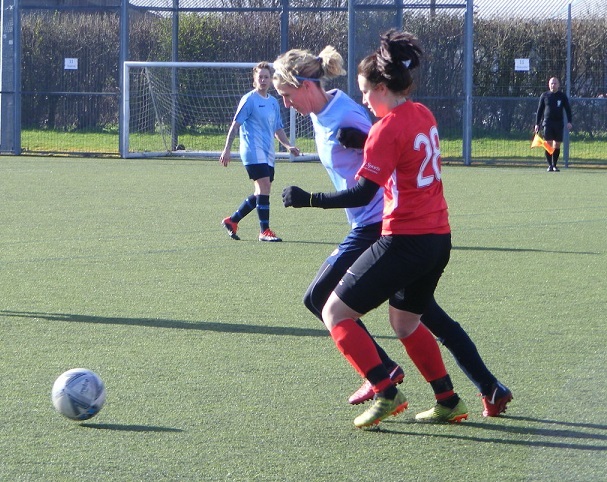 Cambridge City Ladies Development return to the top of the Cambridgeshire Women’s Premiership with victory away to Netherton United Ladies on Sunday. Top of goal difference over ICA Sports Ladies, Cambridge City have 3 games in hand on their rivals. Megan Tonks getting on the scoresheet once again for Cambridge City scoring her 28th goal of the season, A goal too for Yasmin Crow along with one for Philippa Witherspoon returning to play for the 1st time this season. Cambridge City winning the game 3-1. Semi-final weekend for the Cambridgeshire Women’s Division One Cup a new competition introduced last season for the clubs competing in the Championship North & South. 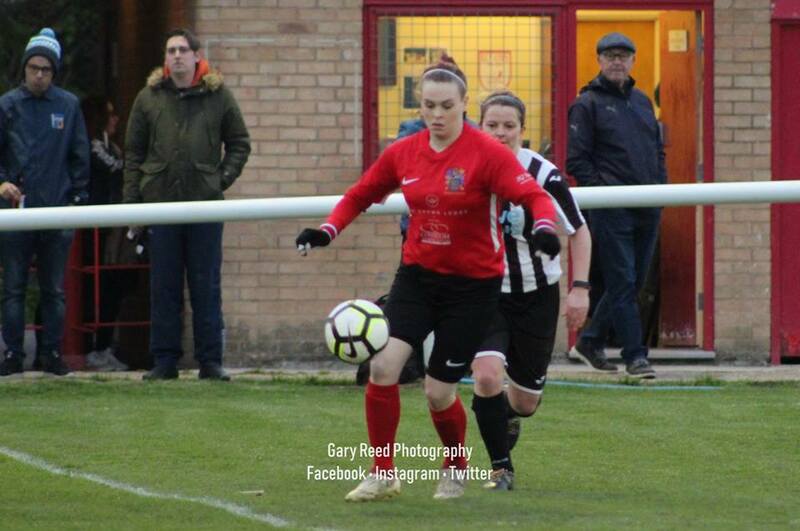 It was to one of these semi-finals Women’s Football East ventured this weekend to watch league rivals Wisbech Town Ladies and Ketton Ladies go head to head in the last 4 of the competition. Ketton leading the way with a 100% record at the top of the Championship North, Wisbech Town just 3 points behind having lost their first league meeting with two to come. Meeting in the Division One Cup this Sunday the game switched to 3G due to the weather the rain almost gone replace by the blustery winds that affected so many games across the country. Not ideal weather for a semi-final match, Wisbech adapting to the conditions better taking an early lead Amy Newell firing home from outside the box to make it 1-0. Ketton though they had equalised when a long range free-kick from defender Beth Goodman went in over the keeper but the effort was ruled out with players running offside one close to the keeper. A narrow lead for Wisbech at half-time the weather giving us a bit of everything. The hosts doubling their advantage early in the 2nd half with top scorers Sophie Swinden running clear on the right to send the ball past the keeper. Claire Lawrenson coming close for Ketton moments later beating the keeper only for defender Kaylie Swinden to get back head her shot wide for a corner. Ketton frustrated couldn’t get anything happening in the final 3rd, the 90 minutes almost up Wisbech were finishing strong pressing for a 3rd goal it came as Chloe Stanborough caught the ball perfectly outside the box to volley the ball home under the diving keeper. 3-0 up into stoppage time Ketton’s goalkeeper Georgia Ireland hurt diving for the ball unable to continue Amy Gray taking up the gloves Wisbech pressed the attack Swinden getting a 2nd goal then going on to complete her hat-trick with Stanborough’s cross/shot finding the top corner in the dying seconds to see Wisbech run out 6-0 winners to reach the final of the Division One Cup. 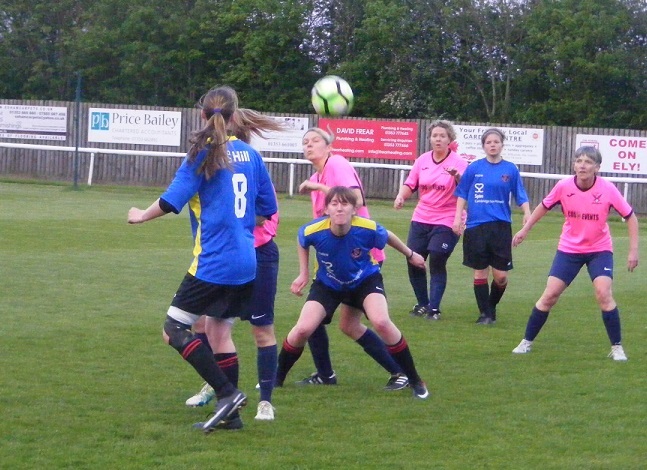 Their opponents will be St Ives Town Ladies Development after they won their semi-final clash at home to fellow Championship South side Burwell Tigers Ladies on Sunday. Also switched to 3G due to the awful weather. St Ives like Wisbech 2nd in the South table looking to chase down Haverhill Rovers Ladies for the title itself. Jade carpenter scoring a brace in the game for St Ives with Fran Worrall also celebrating a goal in a 3-1 victory. The date for the Cambridgeshire Women’s Division One Cup Final announced, will be on Friday 12th April with a 7:30pm kick-off at Ely City FC. One game played in the Cambridgeshire Women’s Championship North this Sunday, Cardea Ladies consolidating 3rd position in the table with a home win against 4th placed Wisbech St Mary Ladies. The hosts taking a 10th minute lead through captain Laura Rudd added a 2nd in the 21st minute to take her goals tally to 17 for the season. Naomi Hall scoring a 3rd 4 minutes later to see Cardea holding a 3 goal lead at half-time. Wisbech St Mary threatened a comeback with 2 goals early in the 2nd half Eilish Brown on target to score in the 48th minute, Josie Turner making it 3-2 7 minutes later. Cardea found the back of the net for a 4th goal past the hour to restore a 2 goal cushion, Phoebe Browness getting the goal. Cardea winning the match 4-2. 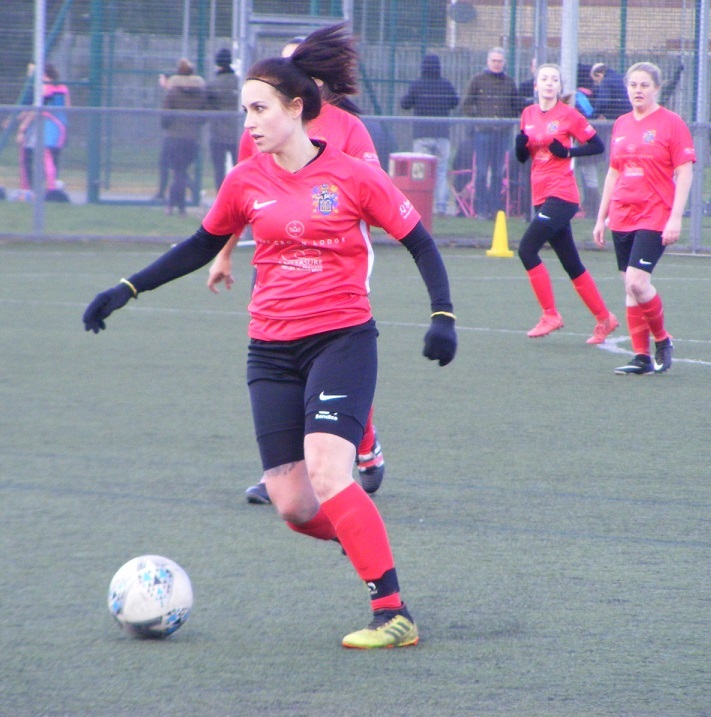 Haverhill Rovers Ladies extended their lead at the top Cambridgeshire Women’s Championship South to 7 points with victory at home to 3rd placed Cambridge Rangers WFC on Sunday. The visitors enjoying a good season themselves scoring twice against the league leaders, Haverhill in their debut season since returning to women’s football building a strong squad, Joeli Kirby’s goals helping the side as they aim for title success scored two more on Sunday taking her tally for the season to 35. 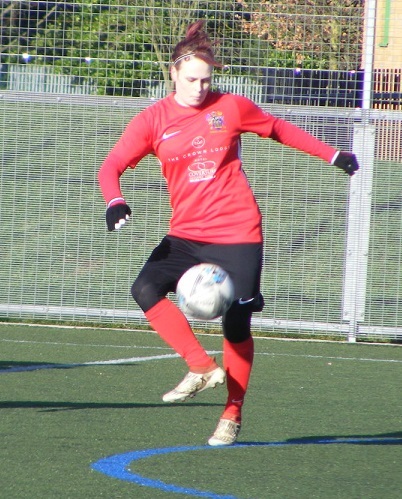 Kayleigh Nolan amongst the goals too scoring at the weekend has 13 now for the campaign with a goal on her debut for Haverhill for Georgina Sparkes in a 4-2 win. At the other end of a contrasting Championship South table Park Ladies were at home to Isleham United Ladies on Sunday the sides both with just 3 points each to date along with Burwell Tigers Ladies. Laura Todd, Louisa Harwood and Emily Ingle all getting on the scoresheet for Isleham it wasn’t enough to take anything from the game as Park scored 5 up the other end to collect the 3 points. This entry was posted in Cambridgeshire Women's Championship North, Cambridgeshire Women's Championship South, Cambridgeshire Women's Division One Cup, Cambridgeshire Women's Premiership, The Round-Up and tagged Cambridgeshire Women's Championship North, Cambridgeshire Women's Championship South, Cambridgeshire Women's Division One Cup, Cambridgeshire Women's Premiership, The Round-Up on March 13, 2019 by WFEast. Semi-final action this Sunday on Women’s Football East the football from Cambridgeshire with Wisbech Town Ladies at home to Ketton Ladies in the last 4 of the Division One Cup. A new competition introduced last season the trophy currently held by Histon Ladies Reserves. The sides from both the Championship North & South entering. 15 entrants this season now down to the last 4. St Ives Town Ladies Development take on Burwell Tigers Ladies in the other semi-final game. Today’s semi-final featuring the top two in the Championship North, Wisbech Town Ladies and Ketton Ladies leading the way both with 100% records until they met a month ago at today’s venue, Ketton winning the game 3-1. 3 points the lead for Ketton the pair have to face each other twice more in the league, the title battle could go all the way. 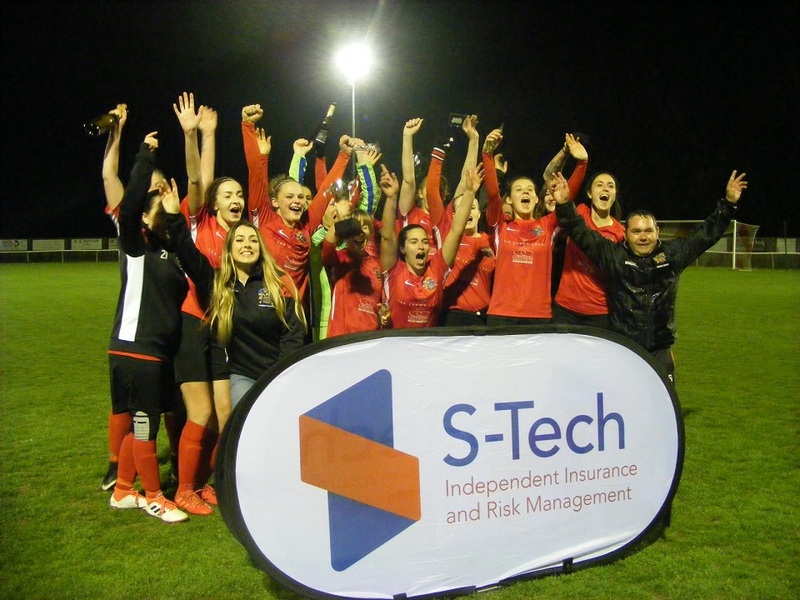 Wisbech Town Ladies enjoying a successful season to date reaching 3 cup semi-finals. Lost their Invitation Cup last 4 match to ERWFL Premier Division leaders Cambridge City Ladies, this the 2nd of the 3 semi-finals with the League Cup to come next weekend. 2nd in the Championship North have had their fair share of injury problems yet have kept up their title challenge, losing the one game at home to Ketton. Ketton Ladies are by some distance West the furthest side covered by the Women’s Football East umbrella, a number of South Lincolnshire sides compete in the Championship North, Ketton west of Stamford, are enjoying a fantastic season themselves, a 100% league record they narrowly missed out on reaching the last 4 of the League Cup having come through the group stage unbeaten. Into the last 4 of the Division One Cup confidence high. Wisbech Town Ladies usually play their home games at Fenland Park, but with heavy rain forecast over night in through much of Sunday morning have the option to switch to a 3G surface within Wisbech at the Thomas Clarkson Academy. Game dropping like flies elsewhere due to the weather, we had a heatwave a fortnight ago, no such luck today. The rain mostly gone it remained overcast the rain giving way to strong blustery winds, the sun trying to make an appearance, not at all ideal for a cup semi-final and there would be a bit of everything before the final whistle blew! Wisbech Town Ladies starting XI – Amy Hepting, Leah Hall, Katie Garner, Kaylie Swinden, Jasmine Luckett, Chelsea King, Abby Sommerville, Chloe Stanborough, Faye Kowalewsky (C), Sophie Swinden & Amt Newell. Subs – Beth Hodgson, Jade Court, Charlotte Rose, Rachael Simpson & Naomi Lyons. Ketton Ladies starting XI – Georgia Ireland (C), Amy Gray, Danielle Usher, Katie Altham, Beth Goodman, Jane Roche, Emma Ward, Sascha Smith, Liberty Cook, Claire Lawrenson & Fran Kavanagh. Subs – Ellie Cotterill, Claire Walpole & Natalie Duncan. The weather’s not great at kick-off blustery and cold the sun low also as Wisbech get the first half underway attacking into the weather wearing Red shirts and socks with black shorts. My first look at Ketton this afternoon wearing sky blue shirts with vertical white stripes, navy shorts and socks. Wisbech push on through the middle, Chloe Stanborough with a driving run to get up in support of Sophie Swinden and Amy Newell in attack, closing in on the area, Katie Altham stands her ground tackling to win the ball back for Ketton. A throw won high on the right Wisbech captain forces Ketton into conceding a corner, played in from the right the ball across the six yard box cleared at the far post. Ketton bring the ball on through the middle, Jane Roche on to Fran Kavanagh back to goal 30 yards out plays the ball wide to Sascha Smith breaking forwards on the left she drives inside ploughing her way forwards, four Wisbech players converge to stop her run. The wind at their backs Ketton’s forwards balls are proving difficult to chase down both Kavanagh and Claire Lawrenson finding the rolling ball picking up speed as it is caught by the wind as they run in behind the Wisbech defence. Lawrenson getting clear on the left into the area receives the pass from Smith on the wing, gets her shot away early past the advancing Amy Hepting keeping goal for Wisbech the ball racing wide across the face of goal. Emma Ward pressing the ball as Wisbech try to get away on the wing wins a throw high on the right the ball on for Lawrenson she has support on the wing from Liberty Cook the ball into her squared inside with Roche making a central run, meets the shot first time 20 yards out her strike blocked inside the box by Katie Garner. GOAL! A little over 10 minutes played and Wisbech take the lead, the hosts with the ball on the left wing put into Sophie Swinden 25 yards out, holds off Beth Goodman as she turns infield sends the pass on central to Newell the striker takes it on across the top of the D looking for an opening, checks her run superbly giving herself half a yard takes on the shot catching the ball well sending it arrowing in on target just under the crossbar to score 1-0. Wisbech with the early lead the weather volatile to say the least strong gusts making the playing conditions tough, the notepad it taking a battering. On the attack, Newell tackled outside the area, Kowalewsky running on to strike the loose ball 25 yards out sends her effort wide. Kowalewsky busy on the right wing pressuring Ketton on the ball forces another corner. This one causing havoc inside the six yard box over the crowd attacking near post Jasmine Luckett beyond nods it back across, goalkeeper Georgia Ireland getting something on it as it’s knocked goalwards not cleared drops back over the keeper only to be hooked off the line Ketton getting their box clear. Goodman coming on to halfway plays a great diagonal ball on for Smith coming in from the left strikes the ball from 25 yards out her attempt whistling over the bar. Conditions are tough the wind strong one moment gone the next keeping possession difficult, both sides seeing passes going awry. Stanborough winning the ball in the middle for Wisbech looking to get forwards support the attackers. Kavanagh pacy with or without the ball at her feet has it this time cutting in from the left shoots from the angle, Garner blocking. Wisbech make the first change of the match Naomi Lyons coming on in attack for Newell. Kowalewsky and Sophie Swinden combine for Wisbech on the right, Altman with Amy Gray stopping the cross the ball put back down the line for Chelsea King she lifts a high ball into the area, Goodman under it heading away for Ketton. Lawrenson coming into midfield pressures the ball winning possession sends it on a deflection of a defender seeing Kavanagh run in behind clear on the left powers on into the area, Hepting coming out to close the angle saves well as the ball is fired at her at close range. Ketton make their first change Claire Walpole on for Cook. Kavanagh is upended the visitors with a free-kick inside the Wisbech half to the left in front of the centre circle. Players go forwards line up across the top of the area Goodman with the wind at her back plays the ball in plenty of high on it the ball flies in over Hepting, Ketton think they have equalised much to their consternation however it is ruled out the flag up with three players encroaching before the ball was played one close on the keeper. Lyons cutting inside with the ball on the left for Wisbech closing in on the area looks to send the pass across for Sophie Swinden looking to get in behind far post the ball intercepted by Altham. Walpole with a quickly taken throw down the right for Lawrenson she takes it on to the byline her initial cross cut out she gets a 2nd bite lifts the ball in towards the near post Ward arriving flicks a leg up to meet the ball turning it towards goal, Hepting is right behind it. Stanborough plays the ball on for Sophie Swinden running up the right channel after ball checks back as the Ketton defence close her down rolls it out to Kowalewsky on the right wing she lifts it over the top with Swinden running into the area, Ireland reading the danger advancing to catch the ball. Not much time left on the clock first half Ketton press the attack left Smith inside Kavanagh and Lawrenson close the ball don force an error Leah Hall putting the ball back to her keeper Hepting catching it inside her area, an indirect free-kick awarded on the six yard line for Ketton, Goodman forwards as red shirts flood the goal line for Wisbech the free-kick is charged down a Wisbech player down treatment needed a corner conceded, play resumes the ball in towards the top of the area headed clear, the half ends just as the weather takes a turn for the worst. A slender lead for Wisbech at the break have dealt wit the conditions better but have been playing into the weather first half the ball running away from Ketton making it difficult to stick in the final 3rd. Few chances created Ketton certainly aggrieved they aren’t level. Both stay out on the field the normally I tweet a few half-time scores out about this time but as it was I was in the eye of a tornado and standing up was tricky enough the sky dark rain falling. Any attempt to put an umbrella up futile. The game far from settled as everyone returns to the pitch for the 2nd half. Ketton to get the 2nd half underway the ball put out to Smith on the wing wins a throw, the ball put into her feet turn inside, garner tackling the ball cleared as far as Roche lifted back into the box Kaylie Smith heading clear for Wisbech as the flag goes up. Up the other end Ireland saves well pushing the ball behind for a corner as Sophie Swinden gets in behind on the right side shooting from inside the box. Just as quickly as the mini storm assaulted the ground, it gives way for the sun breaking through the clouds. Garner intercepts Smith’s ball as she tries to send Kavanagh through on goal. GOAL! An early strike in the 2nd half and it goes to Wisbech who double their advantage the ball hotly contested in the middle, Sommerville then Stanborough the ball pops clear on the right with Sophie Swinden gathering it into her feet and driving on entering the area shoots early before Ireland can set herself, Swinden letting out a roar of celebration as the ball races past the keeper on its way into the back of the net 2-0. Ketton come very close to pulling it back to 2-1 moments later the ball played on up the left for Lawrenson the striker in behind takes the ball on into the area, Hepting coming to close her down, Lawrenson beating the keeper as she goes to ground taking the ball on into the six yard box looks certain to score from the angle the ball fired in, out of no where Kaylie Swinden gets back across the near post to get her head to the ball and send it behind for the corner kick. Wisbech defend the corner are brimming with confidence. Ketton make a change Gray coming off on in her place Ellie Cotterill. Newell is back on for Wisbech Lyons off. Newell winning the ball on for Luckett she pushes on, Danielle Usher tackling wins the ball back for Ketton. The visitors with a throw deep on the right Goodman with it into the box Ward with the cross looking for Smith top of the area Kowalewsky back to defend for Wisbech. Hepting brave coming across to slide in claim the ball as Kavanagh gives chase into the box on the right the pair coming together the keeper needing treatment is okay to continue. Hall with a good tackle stops a Ketton attack puts the ball on for Newell up the left wing the wind returning once again the gust giving Newell too much to do. Sommerville links with Stanborough breaking forwards through the middle for Wisbech, tries to play the threaded pass on for Sophie Swinden, Cotterill cutting it out for Ketton. The visitors getting frustrated, it’s not happening in the final third as they look to reduce the deficit. Goodman over a free-kick wide right a good delivery across the face of goal bouncing in the six yard box, Smith can’t quite reach it at the far post. Sophie Swinden plays the ball across the top of the area right to left, with Newell getting support from Hall behind her the latter putting in a decent cross towards the far post Swinden their, the flag up against her however. Sophie Swinden comes close once again positioned central 25 yards out the ball rolled into her feet she catches it first time her looping effort smashing down off the crossbar. Wisbech growing stronger as the 2nd half progresses, confidence high as the game moves into the final 20 minutes. Lyon rejoining the game in place of Luckett. A throw right side to Wisbech, Stanborough picking it up driving inside 20 yards out is clipped but stays on her feet advantage played as she gets the ball on for Sophie Swinden central she clips it in towards goal, Ireland taking it high right behind it. Into the final 5 minutes of normal play. GOAL! Wisbech are on the attack pressing the ball outside the Ketton box the ball popping around Sophie Swinden with Lyons the ball falling straight into the path off Stanborough just outside the box right of the D meets t on the volley catching it sweetly a perfect strike little lift low to the ground flashes towards goal Ireland diving to her left the ball creeping in inside the post 3-0. More bad news for Ketton as Ireland is hurt trying to make the save may have collided with the post a lengthy spell of treatment follows, Ireland is thankfully up on her feet but can’t continue, Gray the player stepping in to don the keepers gloves. Into stoppage time now and quite a bit to be added with substitutions and injury breaks. GOAL! Gray has no time to bed in as Wisbech go on to score a 4th goal good work from Kowalewsky on the right off a throw turns inside puts the ball on for Sophie Swinden cleverly peeling into space on the wing with her captain drawing defenders to her the pass weighted perfectly Swinden shoots early sending the ball across keeper into the back of the net 4-0. Wisbech send on Rachael Simpson to join the defence in place of Kaylie Swinden. King receiving the pass central from Kowalewsky sees her high ball into the area drop onto the roof of the net. Hall tackles Lawrenson as she tries to drive in behind her on the right. Stanborough charging forwards with the ball through the middle shes her low shot blocked inside the area the rebound taking it away to the right Kowalewsky sending the cross in long to the far post Sophie Swinden on a hat-trick at the far post volleying over from 2 yards out. GOAL! The miss a distant memory moments later as Swinden goes on to claim her hat-trick Wisbech all attack late on driving forwards Stanborough on central for Lyons her driven effort from the top of the area saved by Gray off the substitutes keepers thigh the deflection putting it behind her to the left Swinden there getting her foot over the ball to smash it into the goal beyond 5-0. Ketton are deflated with moment left the weather cruelly deciding to behave late on too as Wisbech press the attack. GOAL! Time for one more goal from the hosts players forwards Stanborough with the ball wide right drifts inside from the angle I suspect it was meant to be a cross but it looked good as she floated a high ball into the area the ball finding the top corner at the far post to wrap up an emphatic result 6-0. Wisbech Town Ladies reach the final of the Cambridgeshire Women’s Division One Cup with a big win against their league rivals Ketton Ladies the final score 6-0. The weather playing a huge factor in the game conditions awful, we had a bit of everything in those 90 minutes, hardly what you need for any game let alone a semi-final. Wisbech adapted the better however and an early goal gave them confidence only growing with another early 2nd half as Ketton saw efforts rules out and denied by last gasp defending. A huge confidence boost for Wisbech to take into the final months of the season, played well from back to front. My first look at Ketton and I am sure this is not the performance they wanted, even without seeing them play before know they are better and no doubt this result will hurt, the scoreline certainly harsh with 3 goals added in injury time. The league to focus on now and they remain in pole position both games against Wisbech at home, the title still very much in their control, will bounce back even though today’s defeat will hurt. Congratulations to Wisbech Town Ladies on reaching the Division One Cup Final where they will meet St Ives Town Ladies Development who beat Burwell Tigers Ladies 3-1. Details of the final to be announced shortly. On to this afternoon’s Women’s Football East – Player of the Match, a few contenders all wearing red shirts this Sunday. Wisbech Town Ladies captain, Faye Kowalewsky setting the tone on the right wing both in attack and getting back to close down the ball. Sophie Swinden has always been a clinical finisher in front of goal and took her goals well this afternoon. Is just edged out to the award however by Chloe Stanborough right from the 1st whistle she was a threat driving on in midfield setting up numerous attacks aswell as disrupting those of her opponents, scoring 2 goals too is my Player of the Match. You ask yourself why do you do it sometimes especially on days like today, the weather was awful a bit of everything, but I know I’ll be back again next Sunday for more, been a tough old week and this is just what I needed. Good to see both sides in action my thanks to both for the team details as appreciated as always onto the next one. 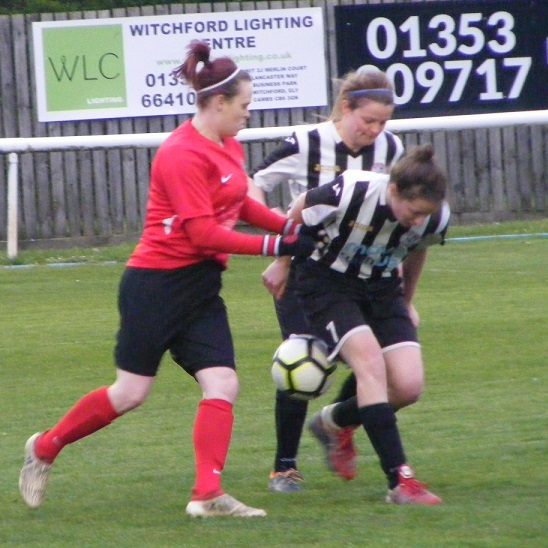 This entry was posted in Cambridgeshire Women's Division One Cup, Match Reports and tagged Cambridgeshire Women's Division One Cup, Ketton Ladies, Match Report, Wisbech Town Ladies on March 10, 2019 by WFEast. Just the two fixtures surviving in the Cambridgeshire Women’s League this Sunday due to the weather both in the cup. Wisbech Town Ladies top of the Championship North away to fellow league side Cardea Ladies in the last remaining quarter final of the Division One Cup. Wisbech Town getting off to a flyer with Sophie Swinden scoring after just 3 minutes, the visitors going on add a further 3 goals through Chelsea King, captain Faye Kowalewsky then Chloe Stanborough to see them leading 4-0 after 25 minutes. A long range strike from Nicola Anderson pulling a goal back for Cardea on 35 minutes the hosts winning a penalty in the closing minute of the first half Anderson striking home from the spot to reduce the deficit to 4-2 at the break. Wisbech Town getting the better of the 2nd half to reach their 2nd semi-final of the season Kowalewsky scoring a 2nd to make it 5-2, both Stanborough and Swinden them added their 2nd goals of the game to extend the lead to 7-2. Aisling Ryan getting on the scoresheet too before Kowalewsky scored again in the closing stages of the game to seal her hat-trick. 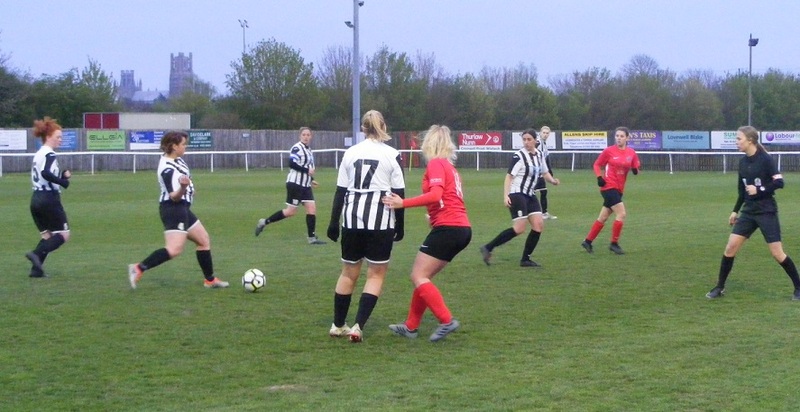 The other game played at the weekend was the last remaining group match in the Cambridgeshire Women’s League Cup, Ketton Ladies already through to the knock-out stages of the competition taking on fellow Championship North side Pinchbeck United Ladies on Sunday. A brace each for Claire Lawrenson and Fran Kavanagh securing a 4-1 win for Ketton to see them finish unbeaten in Group A. 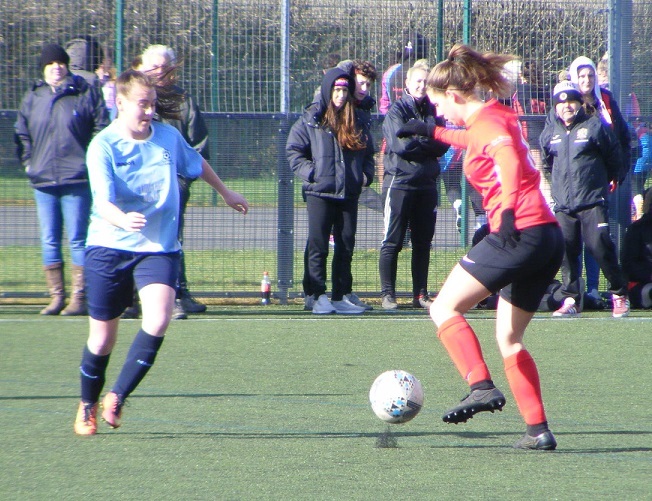 This entry was posted in Cambridgeshire Women's Division One Cup, Cambridgeshire Women's League Cup, The Round-Up and tagged Cambridgeshire Women's Division One Cup, Cambridgeshire Women's League Cup, The Round-Up on February 6, 2019 by WFEast. Like their 1st team, Cambridge City Ladies Development won big at home on Sunday to return to the top of the league. One of 3 games taking place in the Cambridgeshire Women’s Premiership this Sunday. 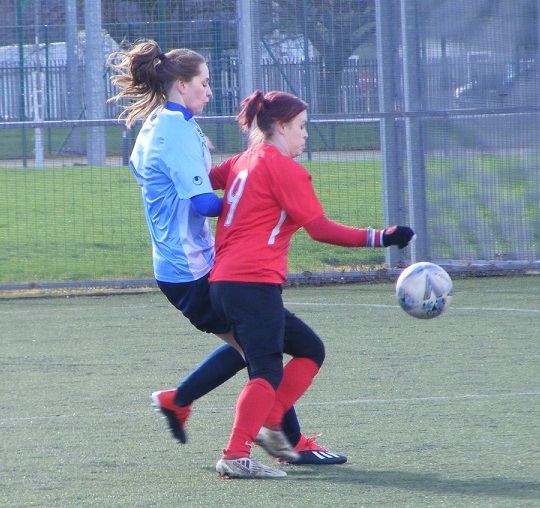 It was a clash between the top two with Cambridge City hosting league leaders ICA Sports Ladies. 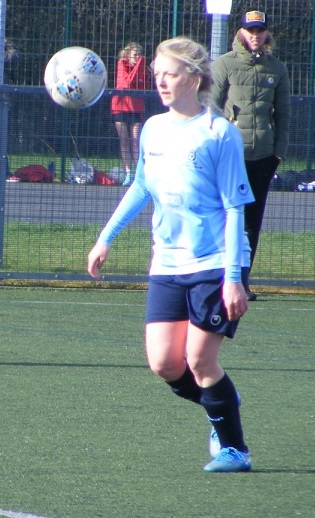 Megan Tonks this in prolific form in front of goal for Cambridge City this season, way out in front on the goal scoring charts, scored another 5 goals this Sunday against ICA Sports to take her onto 26 goals from just 10 appearances. Jade Powell was also amongst the hosts goals netting a brace with Freya Standing also getting a goal in an 8-1 win, 3 starts yielding 4 goals. Carmen Herridge with the consolation goal for ICA Sports. Cambridge University Women climb back up into 3rd position in the league have plenty of games in hand on both leading sides with the gap 6 points to both. Were away to the side in 3rd position going into the weekend Histon Ladies Reserves, nothing separating the sides at half-time with the game goalless the visitors going on to claim the 3 points with a narrow win in the 2nd half goals from Jennifer Atherton and Amanda Wainwright enough to see the game won 2-1 with Sophie Wing scoring for Histon. 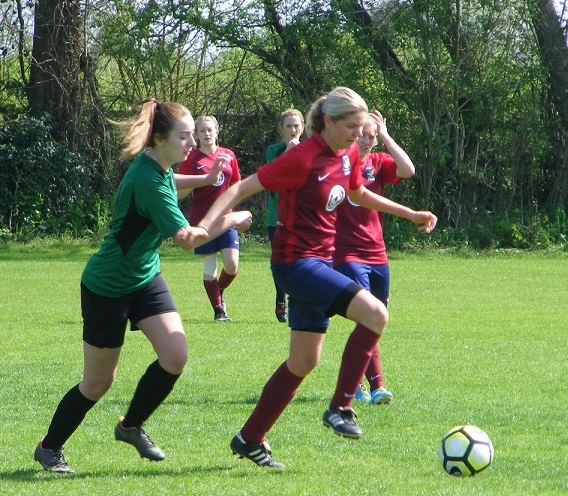 The other game from the Cambridgeshire Women’s Premiership involving the bottom sides with Riverside Ladies hosting Fulbourn Bluebirds Institute on Sunday. Fulbourn getting the 3 points just their 2nd win of the season that lifts them up a place and well positioned to fight for a mid-table finish. 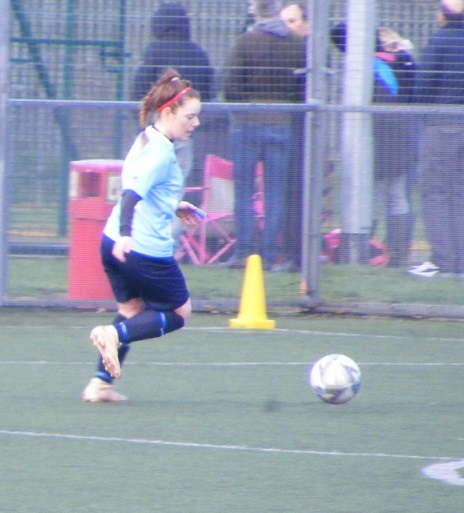 Marie Stubbings scoring a brace, there were goals too for Sharron Pinner and Krissie Taylor in a 4-0 victory. One match in the finish from the quarter finals of the Cambridgeshire Women’s Division One Cup competition this Sunday, Championship North side, Wisbech St Mary Ladies hosting Championship South side St Ives Town Ladies Development. A close one this at least in the 90 minutes the sides battling out a 0-0 the tie heading into extra-time where St Ives Town were the side to at last get their noses in front, the visiting side going in to add a further 2 goals to see them through to the last 4 of the Division One Cup. Jade Carpenter, with Emilee Steel and Georgia Rebane scoring for the first time this season. 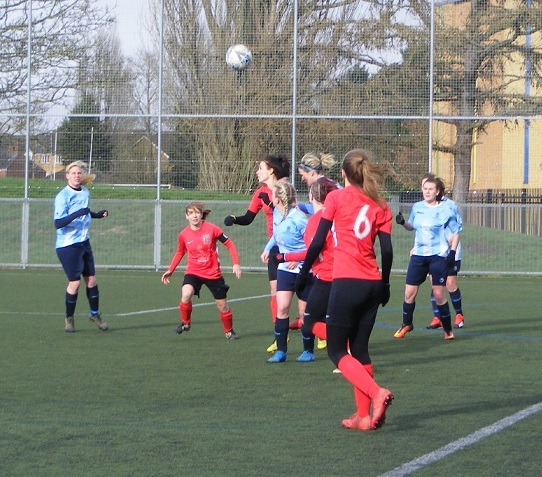 This entry was posted in Cambridgeshire Women's Division One Cup, Cambridgeshire Women's Premiership, The Round-Up and tagged Cambridgeshire Women's Division One Cup, Cambridgeshire Women's Premiership, The Round-Up on January 23, 2019 by WFEast. A handful of matches played in Cambridgeshire this Sunday with the League Cup group stages continuing and the one remaining 1st Round tie from the Division One Cup competition. Two games took place in Group A this Sunday, Premiership leaders, ICA Sports Ladies topping thier League Cup group to with 3 wins from 3. 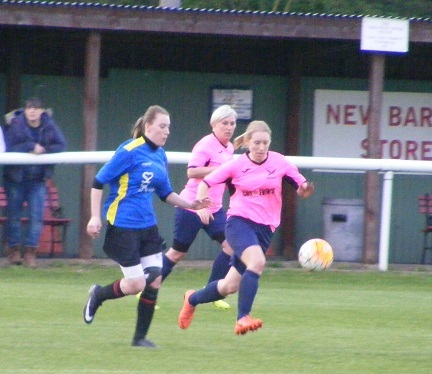 The latest coming away from home as they travelled to play Championship North side, Pinchbeck United Ladies. Goals for Donna Nicholls, Zoe Leddy, Jessica Farchina and Megan Purnell securing a 4-1 victory. Rebecca Navarrette scoring the goal for Pinchbeck. 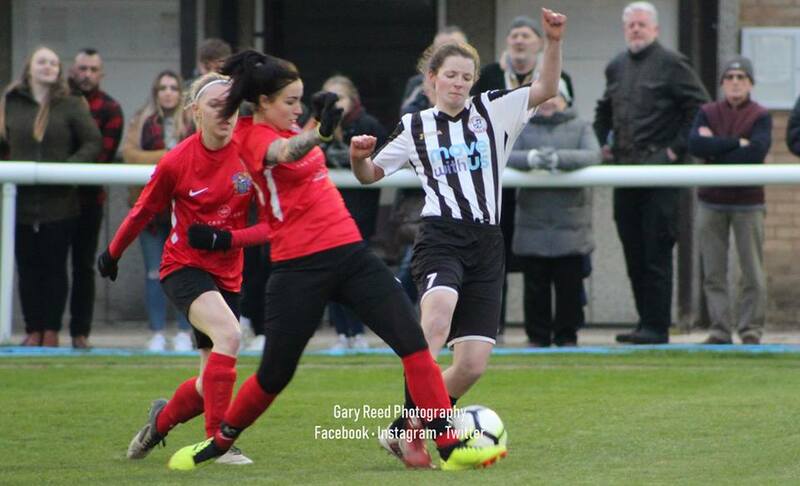 Also in Group A, Championship North side, Cardea Ladies were hosting Premiership side Netherton United Ladies on Sunday. Netherton proving too strong an opponent as they ran out 8-1 winners to record their 2nd win in the Group to move 2nd. Poppy Sparrow with her first goals for Netherton’s senior team getting a hat-trick. Lissy Crutchfield also getting her 1st goal for Netherton. Clare Gallagher scoring a brace with Emily Johnson and Holly Barber also on target with a goal apiece. In Group D of the Cambridgeshire Women’s League Cup, Fulbourn Bluebirds join Haverhill Rovers Ladies and Cambridge University Women on 6 points at the top of the table with their 2nd win in the competition on Sunday. The Premiership side were at home taking on Championship South side, Burwell Tigers Ladies. 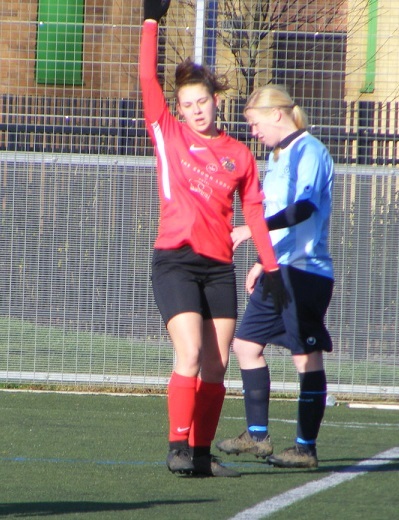 Krissie Taylor scoring a hat-tick for Fulbourn, Sharon Pinner was on target for two goals with a goal each for Stacey Kemp and Marie Stubbings in a 7-0 win. In Group B, Premiership side, March Town United Ladies are 6 points clear at the top of the mini-league table with a game left to play have 4 wins from 4 now the latest coming this Sunday away in the local derby with Championship South side, Park Ladies. A close game however March leading 2-1 at half-time edging the final result 3-2 to pick up the 3 points. 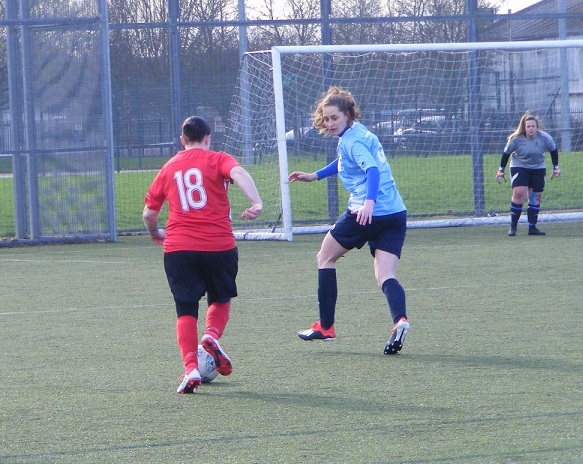 Emma Frost scoring twice for March along with a goal for Naomi McGarvie. Sherrie Martin plus and OG the scorers for Park. In the one remaining 1st Round tie in the Cambridgeshire Women’s Invitation Cup, it was a meeting between the top two in the Championship South, St Ives Town Development at home to Haverhill Rovers Ladies, level on points in the league, their encounter in the Division One Cup a close one to call. In the end the 90 minutes couldn’t separate the sides with the pair drawing 2-2 to send the tie into extra-time, St Ives getting the all important goal in the extra period of play to see them through to the quarter finals with a 3-2 win. Emilee Steele scoring twice for St Ives with Penelope Ford also on target with a goal. Amy Evans and Julie Brown scoring for Haverhill. This entry was posted in Cambridgeshire Women's Division One Cup, Cambridgeshire Women's League Cup, The Round-Up and tagged Cambridgeshire Women's Division One Cup, Cambridgeshire Women's League Cup, The Round-Up on November 28, 2018 by WFEast. ICA Sports Ladies are the new leaders in the Cambridgeshire Women’s Premiership the Peterborough based side active in November playing games have picked up the points to catch and overhaul previous leaders Cambridge City Ladies Development whilst they have had no league action for a month now. ICA Sports with 3 successive wins in that time to move up the table. Were away to Histon Ladies Reserves this Sunday. A brace for Carmen Herridge for ICA Sports takes her onto 7 goals for the season with Bente Hanert also on target with a goal her 3rd after celebrating her 1st two goals for ICA Sports last weekend. The visitors winning 3-1 to go 3 points clear at the top. Cambridge City Ladies Development with 3 games in hand however with a 100% success rate form those 4 matches. 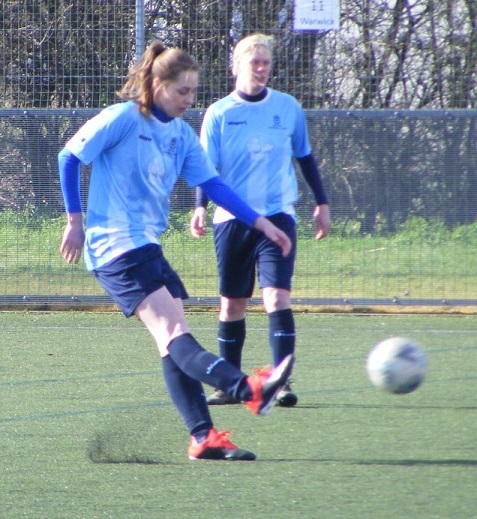 At the other end of the Cambridgeshire Women’s Premiership it was a 10 goal thriller between Fulbourn Institute Bluebirds at home to March Town United Ladies on Sunday. The points had to be shared however as the sides contested an exciting 5-5 draw. Marie Stubbings hitting a brace for Fulbourn, so too did Yasmine Upson with her 1st two goals of the season and a first goal of the season too for Fulbourn’s Sarah Bodger. Louise Balfour doubling her tally for the season for March Town United as she struck the ball into the back of the net 4 times. Emma Searle netting to other goal her 1st of the season. 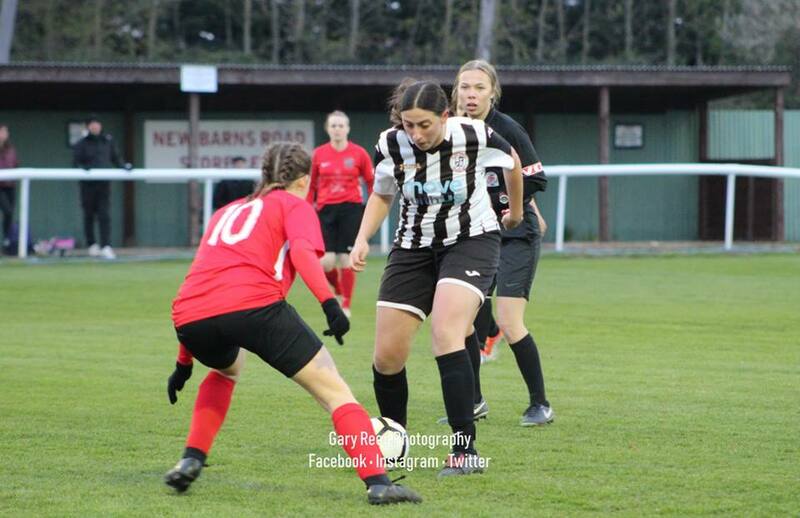 One tie from the 1st Round of the Cambridgeshire Women’s Invitation Cup played this Sunday saw ERWFL Division One side, St Ives Town Ladies hosting Cambridgeshire Women’s Premiership side Riverside Ladies. A comfortable win for the higher league side to progress to the quarter finals with both Fran Worrall and Hannah Seymour-Shove scoring a hat-trick a piece their was a goal each to for Jade Carpenter, Emily Smith and Stephanie Ransome in a 9-0 win for St Ives. They’ve done it at last a first ever league win for Burwell Tigers Ladies, 3 points on the board. Just the 2 last season in their debut year in women’s football are of the mark winning their 6th game of the season, Burwell were away taking on Isleham United Ladies on Sunday in the only game in the Championship South. Charlotte Forgarty scoring twice for the visitors, their were goals to for Elisa Heinamaa, Megan Seabrook-Mead and Ellie Garrett in a 5-1 victory. 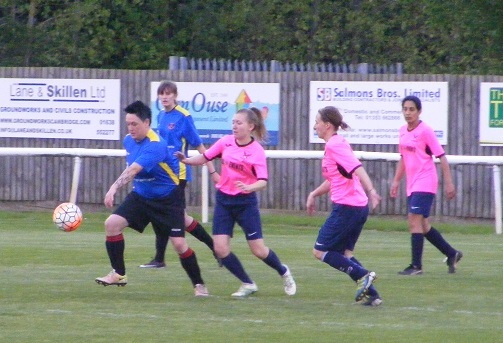 Vicky Sievewright scoring for Isleham United. Had to wait a long time for that and I’m pleased to write about a win at long last for Burwell. Three matches played in the 1st Round of the Cambridgeshire Women’s Division One Cup this Sunday the competition entering it’s 2nd season a knock-out format. Histon Ladies Reserves winning the trophy last season are promoted now so ineligible to compete. It was a good weekend for the top three sides in the Championship North with all progressing in the competition, Ketton Ladies were at home to Pinchbeck United Ladies. Just the one goal scored but it was enough for the Championship North leaders as Ketton advance. Wisbech Town Ladies also had a home draw in the 1st Round of the Division One Cup taking on Championship South side, Park Ladies. A brace from top scorer Sophie Swinden takes her into double figures for the season. Rachael Simpson and Chelsea King also on target for Wisbech Town with a goal each to see them advance with a 4-0 win. A comfortable home win too on Sunday in the 1st Round of the Division One Cup for Wisbech St Mary as they met Cambridge Rangers Women who like themselves lay 3rd in the Championship South. Braces for both Eilish Brown and Carlie Knight for Wisbech St Mary Josie Turner and Demi Newman were also both on target with a goal each in a 6-0 win. This entry was posted in Cambridgeshire Women's Championship South, Cambridgeshire Women's Division One Cup, Cambridgeshire Women's Invitation Cup, Cambridgeshire Women's Premiership, The Round-Up and tagged Cambridgeshire Women's Championship South, Cambridgeshire Women's Division One Cup, Cambridgeshire Women's Invitation Cup, Cambridgeshire Women's Premiership, The Round-Up on November 14, 2018 by WFEast. Another trip back to Ely City FC this Thursday evening for my 3rd final of the week. The Suffolk and Cambridgeshire League’s Cup Finals previously it’s the final of a new competition this time around the Cambridgeshire Women’s Division One Cup, with the top two in the Cambridgeshire Women’s Championship South meeting in the final, Fulbourn Institute Bluebirds versus Histon Ladies Reserves. A new competition introduced by the Cambridgeshire FA this season. Featuring the clubs playing the the Championship North & South. The sides drawn into a groups of 3/4 teams 2 groups representing each league each playing the other once with the overall group winner progressing into the semi-finals. Fulbourn Institute Bluebirds with 3 wins from 3 topping Group A above Newmarket Town Ladies Reserves, Isleham United Ladies and Burwell Tigers. Having a great season are leading the way in the Championship South by 6 points over 2nd placed Histon Ladies Reserves who have 2 games in hand. Losing just the one league game so far this season look well placed for a return to the Cambridgeshire Women’s Premiership. 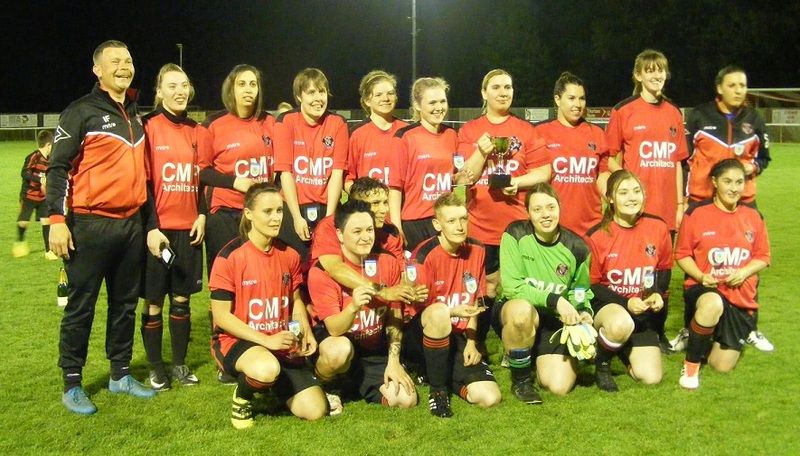 Histon Ladies Reserves are new to the Cambridgeshire Women’s Championship South this season… well sort of… as their squad is largely made up of the former Milton Ladies. Now part of the women’s set-up at Histon as the club establishes a strong platform for it’s girls youth sides to progress into adult football. Histon’s 1st team playing in the ERWFL. The club overall looking to become a strong rival to the Cambridge sides City and United. Would have expected Milton if they had still been there to be challenging for the league title this season, and so it is the case as Histon Ladies Reserves. Lay 2nd in the Championship South 6 points behind Fulbourn Institute Bluebirds with 2 games in hand. Were drawn into Group B in the Division One Cup along side St Ives Town Ladies Development and Cambridge Rangers. A 1-1 draw with St Ives Town a 5-2 win over Cambridge Rangers seeing them top the Group and progress to the semi-finals. 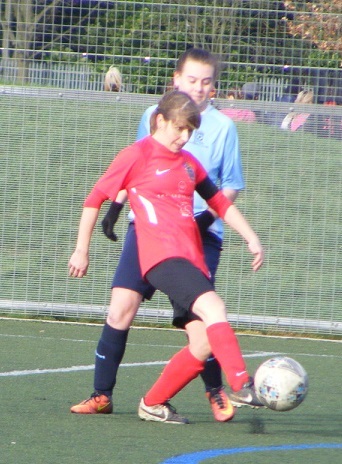 Histon Ladies Reserves were involved in a 9 goal thriller at home to Riverside Ladies in the semi-final of the Division One Cup. A 4-1 lead to Histon in the 1st half, Kirsty Lemmon-Sparks with a hat-trick, Riverside battled back to score 3 goals in the 2nd half Histon getting an all important 5th goal to reach the final with a 5-2 win. I was at the 2nd semi-final to watch Fulbourn Institute Bluebirds at home to Wisbech Town Ladies in the Division One Cup. The Championship North side taking the lead on 20 minutes through top scorer Sophie Gutteridge. Fulbourn battled back to lead 2-1 at the break with goals from Krissie Taylor and a volley from the edge of the box from top scorer Marie Stubbings. Sharon Pinner scoring in the 2nd half to put Fulbourn 3-1 up they held on to win despite Gutteridge pulling it back to 3-2 with 15 minutes left. So it’s Ely City FC’s Ellgia Stadium for a 2nd night running. It hasn’t changed much in 24 hours. The weather still pleasant a little more cloud around tonight and more tractors on the road but I knew I couldn’t get away with it two nights running. 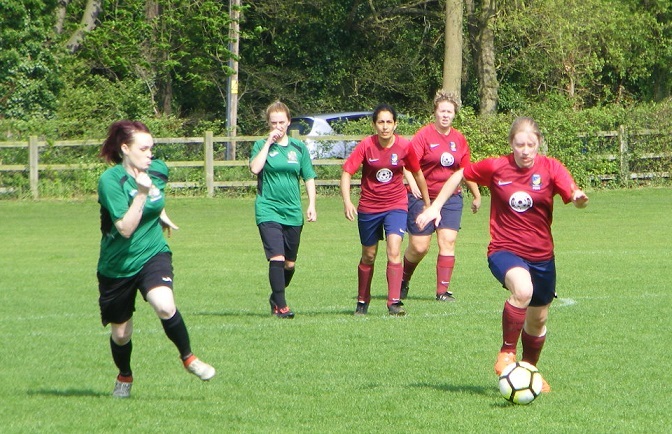 Fulbourn Institute Bluebirds starting XI – Samantha Issacson (C), Seema Grewal, Krissie Taylor, Sarah Bodger, Nikki Cowan, Jo Woods, Emma Clark, Sharron Pinner, Amy Smith, Katie Luddy & Marie Stubbings. 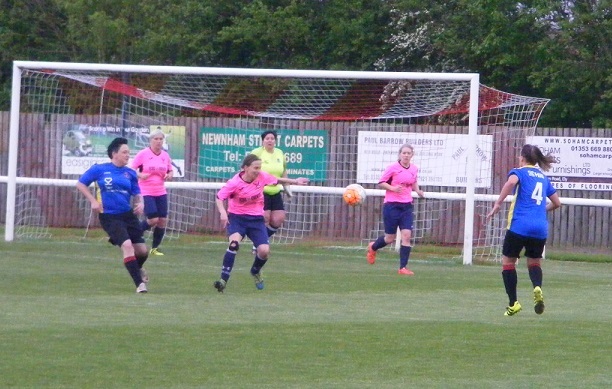 Subs – Holly Hayes, Vicky Neal, Stacey Kemp, & Lucy Clarkson. Histon Ladies Reserves starting XI – Danielle Busby, Lauren Threadgold, Kat Brown, Kirsty Smith, Sarah Freestone (C), Casey Kelly, Sam Cousins, Daniella Briggs, Abi Davies, Kirsty Lemmon-Sparks & Philippa Hayden-Evans Subs – Kirsty Jenkinson, Emma Gillespie, Amanda Binge, Becca McNally & Carly Dawson. Three female officials for this evenings final with Stacey Fullicks fresh from helping Cambridge City Ladies secure runners-up spot in the ERWFL Premier Division in the middle assisted on the line by Dulcie Asher and Romana Bria. Andy Phillips the 4th official. Histon to kick off the Division One Cup Final wearing their blue away shirts with yellow trim, black shorts and socks. 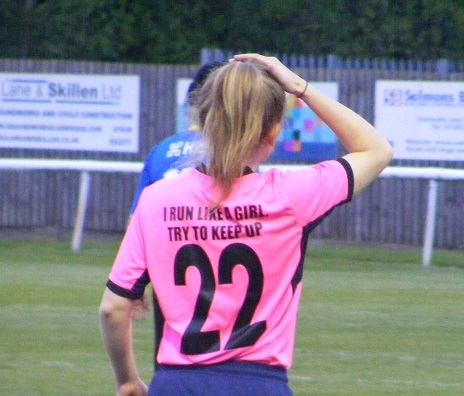 Fulbourn kitted out in pink shirts each with an individual message of motivation printed upon the back along with navy shorts and socks. The ball played back and forth between the midfield’s Fulbourn spreading the play out to the right wing Amy Smith breaking forwards her cross gathered safely by Histon goalkeeper, Danielle Busby. A corner for Fulbourn right side the ball in near post defended a 2nd corner awarded. A higher ball in this time Sharron Pinner up to head the ball down into the six yard box, Philippa Hayden-Evans back defending for Histon shielding the ball before it is cleared out to the left. A good start to the match from Fulbourn pressing forwards Jo Woods winning the ball in the middle playing the ball on to Marie Stubbings moving into the left channel, Lauren Threadgold defending for Histon preventing the cross coming in. Nikki Cowan cutting a ball out put in diagonally from the left as Histon’s Kirsty Lemmon-Sparks breaks forwards. Pinner linking up with Stubbings left side the cross played into the box the ball deflected gathered bu Busby. Histon get the ball forwards win a corner kick on the right the delivery long Seema Grewal dealing with it at the far post for Fulbourn launch a counter attack the ball played on for Smith on the right bursts forwards turning a cross in towards the box, Busby claims it at her near post. The ball regained in the middle of the park Fulbourn’s Emma Clark into Woods played forwards for Katie Luddy support from Stubbings, Luddy shots her effort from outside the area blocked. Histon make an early switch Sam Cousins coming off, Kirsty Jenkinson coming on. Krissie Taylor gets forwards from left back for Fulbourn, Woods making a good run inside her Taylor playing the ball in towards her a clever flick to control the ball on the run knocking it past her into the area six yards out left of the goal shoots her strike racing wide across the face of goal. Histon are beginning to settle, Daniella Briggs out on the left side bringing the ball forwards a wonderful ball sent into the area from deep travelling all the way to the far post Abi Davies running in clear on goal hits it first time her effort smashing against the base of the post spins back out into the six yard box a scramble for the ball Fulbourn manage to get it away. A high ball played on up the right a tricky one for Fulbourn’s Sarah Bodger gets her head on the ball only it lands behind her Davies alert for Histon darts around the defender and sends the cross back towards the top of the area for Hayden-Evans, her shot his charged down, the rebound coming to Briggs to her left she shoots wide. No sooner have Histon rattled the woodwork at one end then Fulbourn get up the other end in a rapid fire attack and do the same, Luddy with the run in the centre onto the ball striking it from 20 yards out the ball rising as it flies in towards goal has Busby beaten cannons off the crossbar. The woodwork is struck for a 3rd time Histon on the attack the ball on the left the cross into the area Hayden-Evans central helps it on to Davies to her right her rising shot coming at Samantha Issacson in the Fulbourn goal fast gets a touch on the ball as it crashes against the bar, Fulbourn clear and go on the attack Stubbings playing the ball on for Smith on the right, Kat Brown dealing with the threat defends for Histon. Fulbourn with possession Woods with an excellent tackle on for Stubbings, Luddy in support the ball played into her the shot skied over the bar. Grewal comes forwards for Fulbourn right side, Smith receiving the pass tries to turn inside Brown tackles regains possession. Clark gets the ball back for Fulbourn, Stubbings seeing the pass into her back to goal on the edge of the box, looks to turn a shoot, Histon’s captain Sarah Freestone has her closely marked. Cousins returns to the pitch for Histon Casey Kelly coming off. Hayden-Evans breaks clear after the ball as Fulbourn are caught with a high line at the back running towards the box she shoots the ball saved confidently by Issacson. Stubbings is fouled by Freestone on the byline left of the area as she tries to force her way past the defender. The free-kick taken quickly Taylor forwards free top left corner of the area delivers a ball into the far post Pinner up and twisting as she heads the ball sends it goalwards, lacking pace Busby is well placed to claim the ball. Issacson with another good save off Lemmon-Sparks as the attacker latches onto a poor defensive clearance. The shot in low Issacson diving to her left pushing the ball away from goal. Issacson is hurt making another save soon after the ball fired across the area from the right comes to Hayden-Evans closing in the far post can’t get her shot over the keeper as she goes to ground the ball struck against the keeper. Issacson is okay to continue. Fulbourn do make a change Vicky Neal coming on for Pinner. Neal in the action straight away with the defensive tackle to deny Davies a run into the area cutting in from the right. The first half ends goalless, has been lively and if the woodwork hadn’t been involved Histon would be leading 2-1 as it is honours even. Two evenly matched sides Fulbourn starting well have looked lively, Histon settling and posing a threat themselves both sides getting the ball out to their wide players. Issacson with a couple of important saves to Fulbourn. No telling as to who might come out on top 2nd half, extra-time and penalties haven’t been called for yet in any final I’ve been… yet. A change for Fulbourn at the start of the 2nd half Stacey Kemp wearing the no 90 shirt on for Smith. It’s Fulbourn to kick off the 2nd period. Luddy out wide right wins Fulbourn an early corner kick the ball cut out and Histon look to counter attack through the middle Woods with the tackle to stop Histon getting beyond halfway. Woods with another strong tackle comes back to help on the right as Davies with Hayden-Evans, tries to play Kirsty Smith in as she makes a run towards the area, Woods coming with her. Kemp bringing the ball on for Fulbourn central shifts it out to Luddy on the right her cross in to the area sees Taylor arriving strikes the shot 1st time, Busby with a good save parrying the ball away then is fouled as she moves in to claim it. Briggs with Lemmon-Sparks attacking left side for Histon the ball won back by Fulbourn played on through the middle, Kemp looking to get her head on it arriving in the box, Busby coming puts her fist through the ball punching it away as she goes over Kemp. Fulbourn are getting crosses into the Histon area, almost all are bread and butter claims for Busby. Histon like the 1st half are a little slow to get going momentum starting to build, an attack is launched players breaking forwards left side play switched out to the right Davies 25 yards out from goal sent a shot back in wide across goal. Taylor gets forwards on the left a one two with Stubbings, Taylor goes on her cross along the top of the area Luddy with the shot charged down by Freestone. Cousins takes the ball on left side on for Hayden-Evans ahead of her, Neal with the challenge denying the attacker a run at goal. Play is stretched a good tempo, both sides moving the ball quickly. Hayden-Evans finds herself clear in on goal coming into the area from the right Issacson comes to close her down the ball past her into the side netting. Briggs with a driving run at the Fulbourn defence rides two challenges before being stopped by the 3rd. Grewal with a vital interception as Briggs looks to run onto a diagonal ball from Cousins in a central position. GOAL! The deadlock is broken at last and it’s Histon who get their noses in front a spell of sustained possession, Fulbourn can’t get it away on the left side close to the byline the ball pinging back and forth Hayden-Evans, Lemmon-Sparks and Davies all challenging for the ball before Davies gets hold of it and turning the angle acute fires a shot in across goal to bury the ball inside the far post. Histon celebrate a flag is raised after consulting the officials let the goal stand 0-1. Issacson well placed inside her goal to save the ball as Lemmon-Sparks moves into a shooting position 20 yards out from the right after receiving the ball from Hayden-Evans. Woods claiming the ball drives forwards lays the ball on for Stubbings right her cross in hooked clear by Freestone. Hayden-Evans and Davies both finding space in attack as Fulbourn push on looking for a quick reply. Taylor pulling up has to come off Bodger comes back on. Brown winning the ball for Histon as Stubbings looks to twist inside her into the box. Woods with Luddy work the ball up the line for Stubbings her cross in cleared for a corner on the right. A short corner from Fulbourn the cross put in from a deep position, Clark running in to attack it near post Davies back defending does well for Histon. Lucy Clarkson intercepts for Fulbourn at the back as Lemmon-Sparkes sends a cross into the box from the left Davies closing in on the right. Carly Dawson comes on for Histon for Threadgold at right back with a little under 5 minutes left. Fulbourn keep coming forwards risk leaving space in behind as they search for the equaliser. Davies bringing the ball on jinks left the right before striking the ball in towards goal her low drive gathered by Issacson. Lemmon-Sparks on for Davies as Histon break, Pinner blocking, Davies’ strike away for a corner. Bodger clearing the ball for Fulbourn, Kemp on it checks back inside Histon close her down scramble the ball away. Into the closing minutes of the match. Fulbourn are getting the ball into the area from wide positions Busby claiming it once again plucks a high delivery into the near post down into her body. Luddy challenged on the right, a last gasp corner for Fulbourn everyone bar Issacson goes up for it the set-piece, the delivery in is played behind goal, the final whistle blows and Histon celebrate as they become the 1st ever winners of the Cambridgeshire Women’s Division One Cup. A single goal wins the final scored by Histon Ladies Reserves, Abi Davies in the 2nd half. An entertaining contest both sides lively, Fulbourn certainly had their chances. Good movement and competing well against a physical Histon side who themselves created opportunities finding space out wide. The woodwork struck 3 times in the 1st half, Histon looked to have the more direct threat in front of goal. Issacson denying a couple of strikes. Busby at the other end comfortable with anything Fulbourn played into the box from wide. Silverware for Histon Ladies Reserves in their debut season. The two sides are still competing for the league title a double still on however Fulbourn hold the advantage there. On to this evenings Women’s Football East – Player of the Match. As the game wore on the number of potential candidates was slowly whittled down to just one. For Histon she posed a threat all game on the right getting forwards finding space, striking the woodwork twice in the st half and getting the all important winning goal in the 2nd half so the award goes to Abi Davies. Congratulations to Histon Ladies Reserves on winning the Cambridgeshire Women’s Division One Cup. That’s it 3 finals in 3 nights boy was I tired by the last one hence the later publishing I needed the sleep. Still I enjoyed it starting on Tuesday with the Suffolk Women’s League Cup then 2 finals in Cambridgeshire. a brief rest before the first one of two cup final doubles starting in Norfolk on Sunday. Back to Ely again tonight however not for football however but finally to get around to seeing Avengers Infinity War.. I very nearly avoided any spoilers but I’ve waited a week afterall and before you ask I’m not writing a report on that one. Thanks to everyone again for their help last evening. 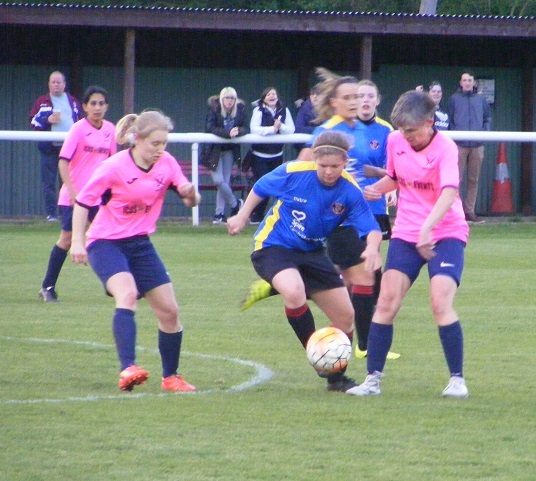 This entry was posted in Cambridgeshire Women's Division One Cup, Match Reports and tagged Cambridgeshire Women's Division One Cup, Cup Final, Fulbourn Institute Bluebirds, Histon Ladies Reserves, Match Report on May 4, 2018 by WFEast. 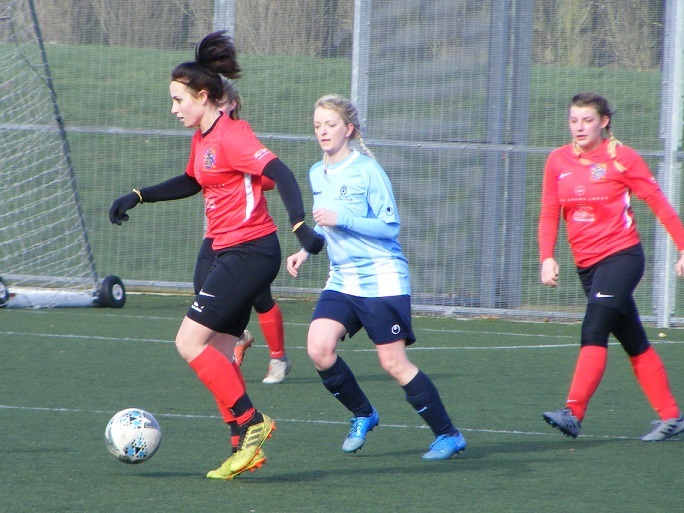 Women’s Football East was in Cambridgeshire this Sunday to watch the semi-final between Fulbourn Institute Bluebirds and Wisbech Town Ladies in the new Division One Cup competition. The two sides topping their respective groups to make it into the last 4 of the competition. Histon Ladies Reserves awaiting the winner after their 5-4 success over Riverside Ladies last weekend. At Fulbourn it was Wisbech the visitors who got off to the better start pushing forwards and causing problems for the Fulbourn defence top scorer Sophie Gutteridge pressing the ball inside the box nicking it to attack and score. Fulbourn got themselves back into the game breaking away down the right Marie Stubbings cross put into the six yard box was nodded in by Krissie Taylor from close range. The goal giving Fulbourn confidence the home side finished the 1st half the stronger taking the lead Stubbings the scorer with a fantastic volley from the top corner of the area. A numerical advantage from the bench Fulbourn could rotate players Wisbech suffered another injury blow as goalkeeper Becky Milner pulled up hurting her knee and had to come off. Fulbourn on top pushed forwards Sharon Pinner breaking forwards into the box timing her run perfectly as Stubbings sent the ball into the area to stab her shot wide of the substitute keeper to extend Fulbourn’s lead. 15 minutes left and Wisbech pulled it back to 3-2 Gutteridge through to attack lobbing the ball over the keeper to score her 2nd of the game. Fulbourn though held onto their lead and reached the final. The game to be played on Thursday 3rd May at Ely City FC with a 7:30pm kick-off. St Ives Town Ladies leading the Cambridgeshire Women’s Premiership were playing another double header this Sunday against ICA Sports Ladies. Took 4 points from the games with a win and a draw. Amy Seymour-Shove netting the only goal of as St Ives Town collected 3 points in a 1-0 win. In the 2nd game Katherine Speed netting a brace for St Ives Town her goals were cancelled out with Donna Nicholls and Megan Purnell both on target for ICA Sports in a 2-2 draw. 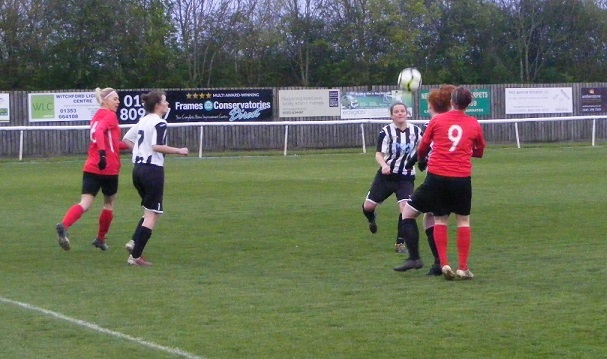 3rd placed Newmarket Town Ladies were playing host to Netherton United Ladies on Sunday. 4 points between the sides Newmarket Town ensured victory late into the game. Drawing 0-0 at half-time. The dead lock was finally broken on the hour Molly Agnew getting the goal to put the hosts into the lead. Into the final 10 minutes and two late goals for Newmarket Town sealed the win. Hollie Turner making it 2-0 with Abbi Griffin adding a 3rd goal with 3 minutes left. The gap closed to a point Newmarket Town are now above Netherton United into 2nd having been awarded 6 points over bottom side Park Ladies. Park Ladies themselves finished their season on the road against Cambridge University Women the side immediately above them. The hosts getting off to a great start scoring in the opening seconds, Amanda Wainwright getting the goal. Moriah Mulroe scoring a 2nd goal for Cambridge University in the 20th minute. Both players scoring another goal each in the 2nd half a goal for Shannon Horner in injury time saw the hosts run out 5-2 winners. In the Cambridgeshire Women’s Championship North league leaders Ketton Ladies were at home on Sunday taking on Riverside Ladies. The visitors coming out on top to maintain their 100% league record with a 7th win to climb back into 3rd position. Jane Roche scoring for Ketton. Goals fro Gabija Pavlova and Samantha Woodham saw Riverside win the game 2-1. 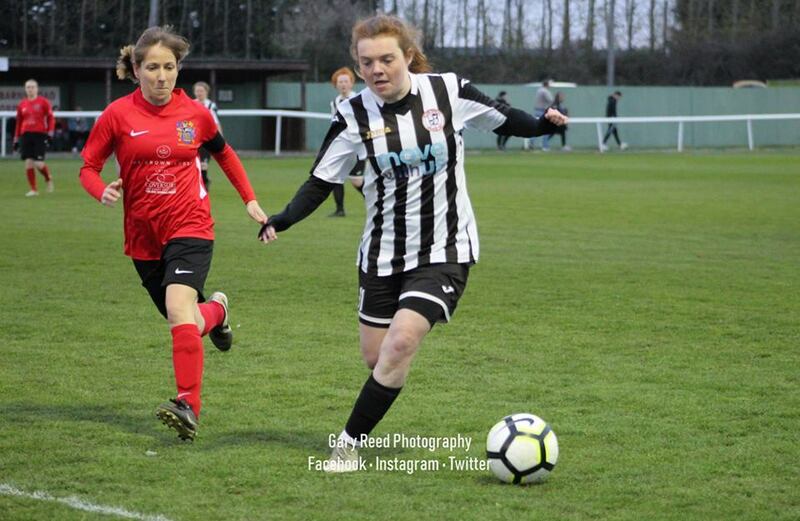 Wisbech St Mary close the gap on the leaders as a result as they recorded a big away win at Pinchbeck United Ladies on Sunday. 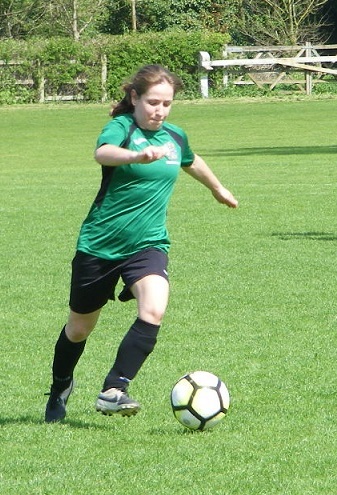 Amy Magnus scoring a double hat-trick for Wisbech St Mary with Carlie Knight also scoring a brace in an 8-0 win that see’s the 2nd placed side close the gap to Ketton t 7 points. In the other match played in the Championship North this Sunday it was a 1st point of the season for bottom side Orton Rangers Ladies earned away to Hungate Rovers Ladies on Sunday. The sides drawing 2-2. St Ives Town Ladies Development 3rd in the Championship South were victors this weekend at home against Isleham United Ladies winning the game 3-1. Bottom side Burwell Tigers earned a point at home just their 2nd of the season with Tess Smith getting the goal in a 1-1 draw with Cambridge Rangers. This entry was posted in Cambridgeshire Women's Championship North, Cambridgeshire Women's Championship South, Cambridgeshire Women's Division One Cup, Cambridgeshire Women's Premiership, The Round-Up and tagged Cambridgeshire Women's Championship North, Cambridgeshire Women's Championship South, Cambridgeshire Women's Division One Cup, Cambridgeshire Women's Premiership, The Round-Up on April 25, 2018 by WFEast.